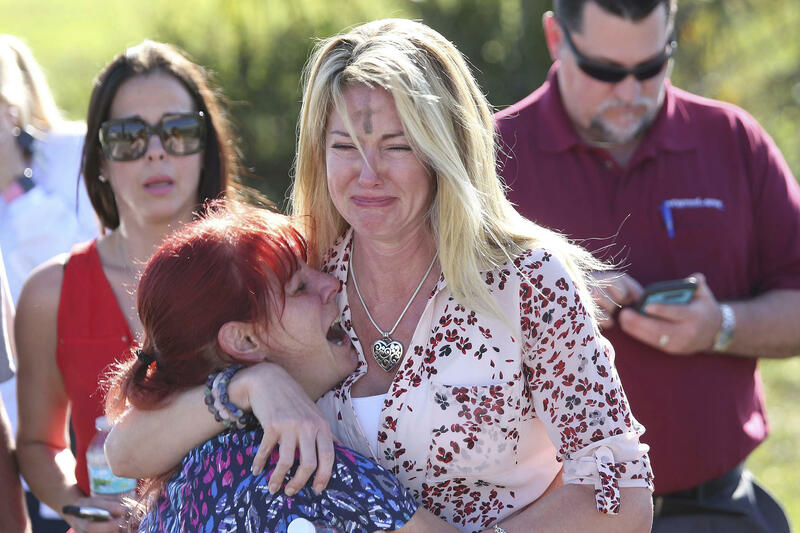 Parents wait for news after a shooting at Marjory Stoneman Douglas High School in Parkland, Fla., on Wednesday. Officials say 17 people were killed and a suspect is in custody. A law enforcement officer tells anxious family members to move back. 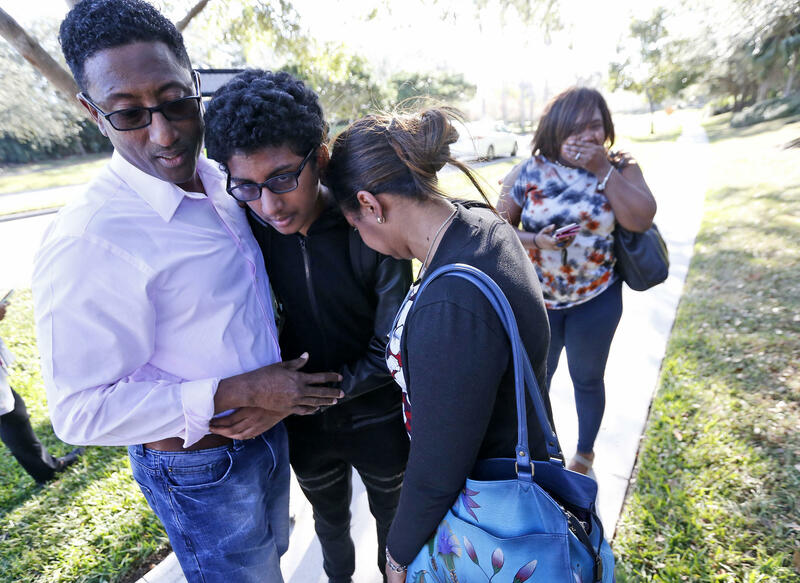 Family members embrace after a student walked out of the high school. Anxious family members wait for information on students. 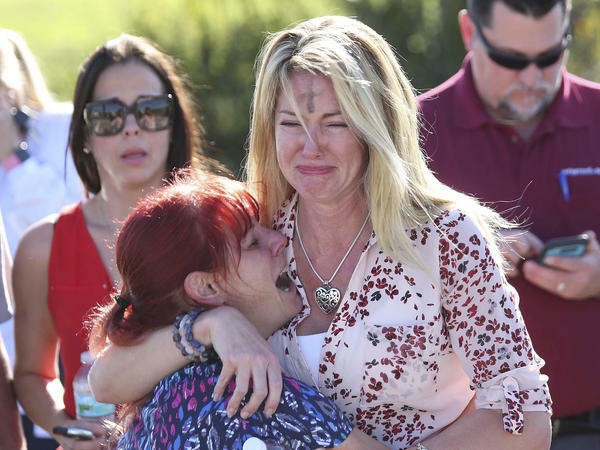 A woman consoles another as parents wait for news. 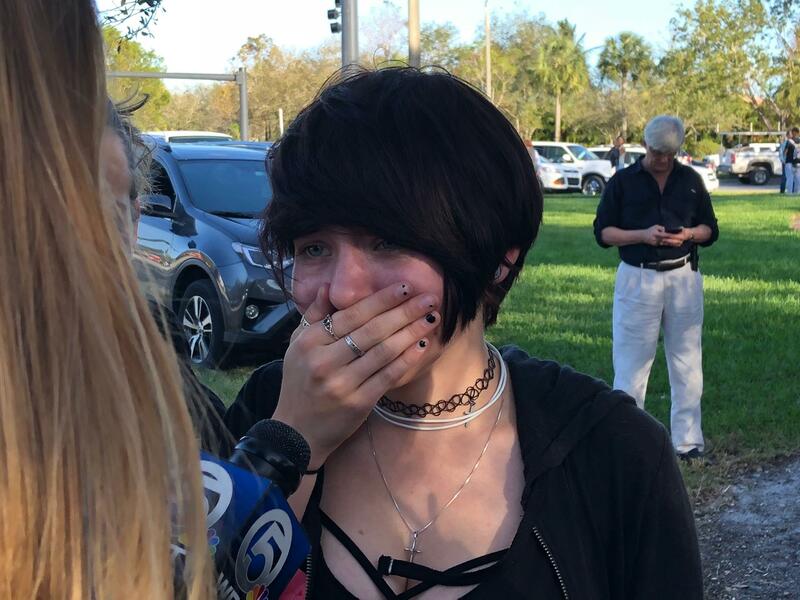 A student reacts as she talks to a television reporter. Medical personnel tend to a victim outside the school. 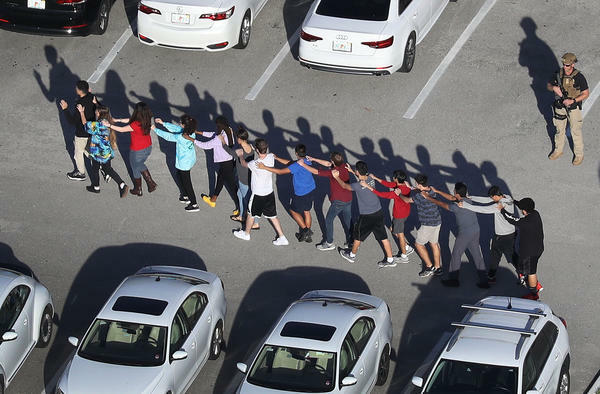 People are brought out of Marjory Stoneman Douglas High School in Parkland, Fla., after a shooting at the school Wednesday. 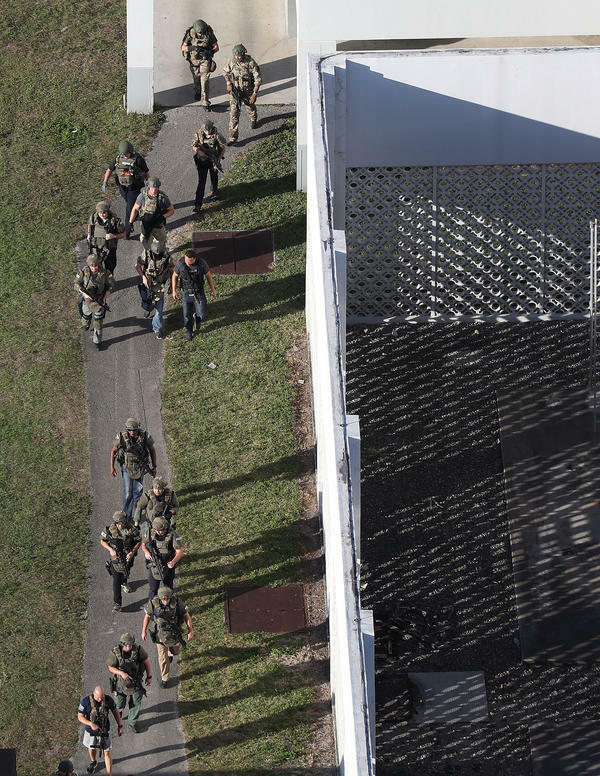 Officials say 17 people were killed and a suspect is in custody. 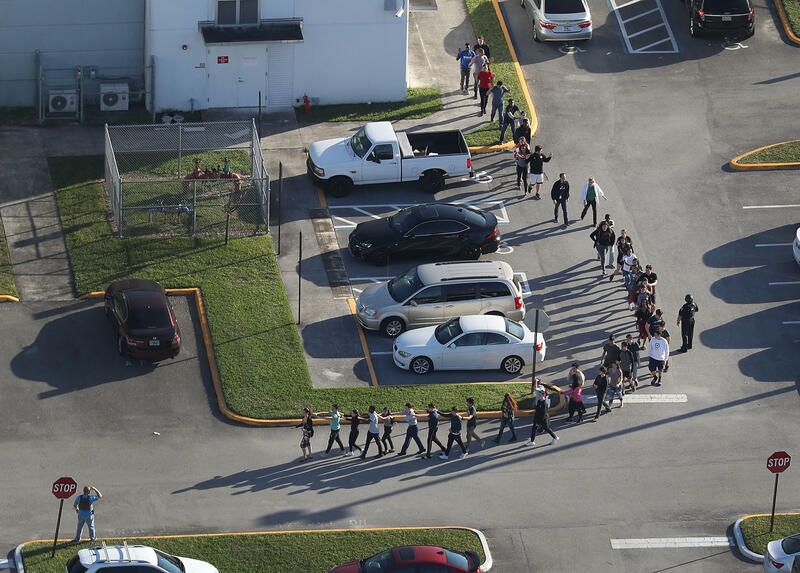 People wait for loved ones as they are brought out of the school. Law enforcement personel work the scene. 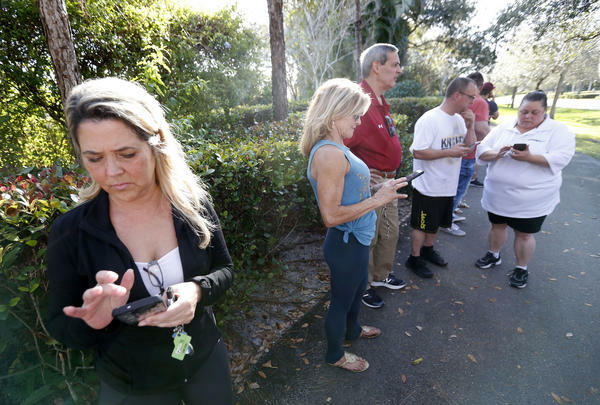 Parents wait for news about their children at the school. Anxious family members wait for news of students. 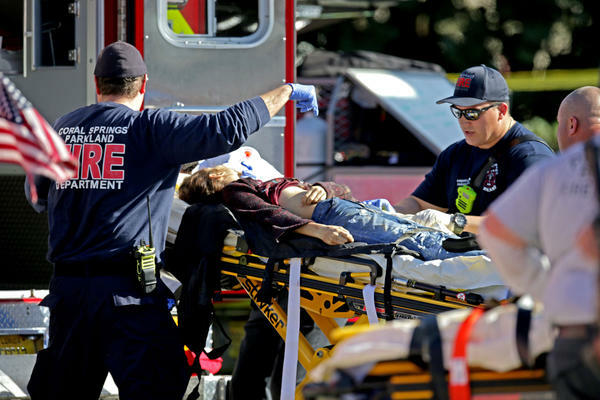 The Broward, Fla., sheriff said 17 people are dead in the Wednesday shooting at Marjory Stoneman Douglas High School in the city of Parkland, northwest of Fort Lauderdale. He said a suspect is in custody. In news conferences after the incident, Sheriff Scott Israel said 12 of the people who died were found inside the school building and two were found just outside. Another victim was on the street, and two people died at the hospital. Israel said authorities have identified 12 of those killed in the shooting and are working to identify the rest. He said none of the names and ages of the victims would be disclosed pending notification of their families. However, he did say that one of the deceased was a school football coach and one of the wounded, the son of a deputy sheriff, sustained a non-life-threatening injury. Explaining why identifying the victims has taken some time, the sheriff said they didn't have backpacks or cellphones with them that might have helped. 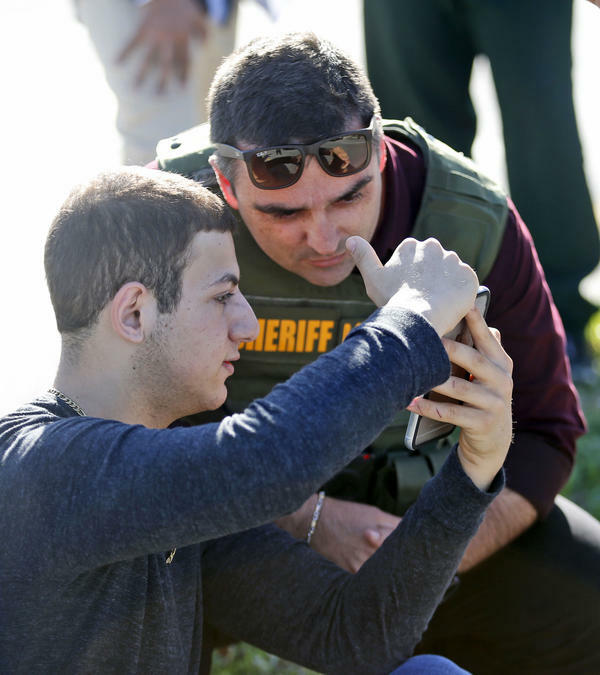 Israel identified the suspect as 19-year-old Nikolas Cruz, a former student who had been expelled for disciplinary reasons. The sheriff said the shooter used an AR-15 rifle and had "multiple magazines." The suspect was found off campus and was taken into custody without incident. Israel said investigators already have examined the suspect's statements on social media, calling them "very, very disturbing." County school Superintendent Robert Runcie said that the shooter was enrolled in a school elsewhere in the district. Runcie said all classes and activities at Marjory Stoneman Douglas have been canceled for the rest of the week. The district will provide grief counselors for students and their families, as well as for staff members, starting Thursday morning. Counselors will also be available at an adjacent middle school, which will be open. In a conference, Florida Gov. 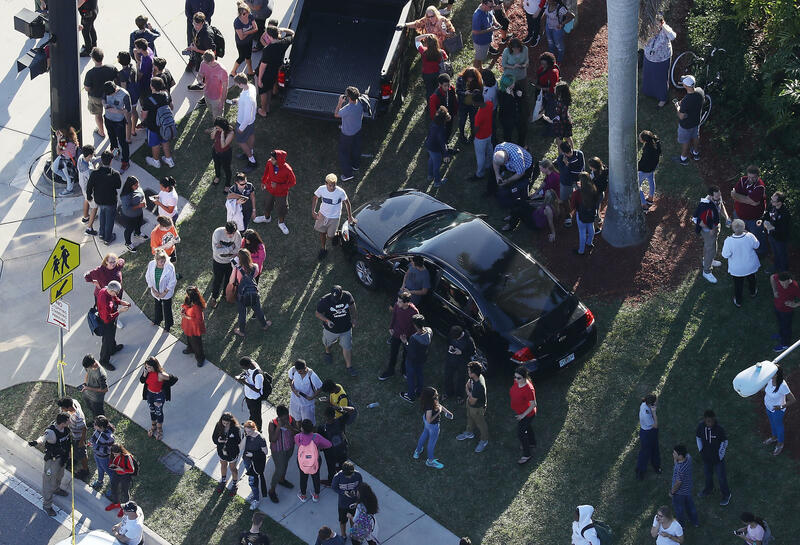 Rick Scott called the shooting "just absolutely pure evil." 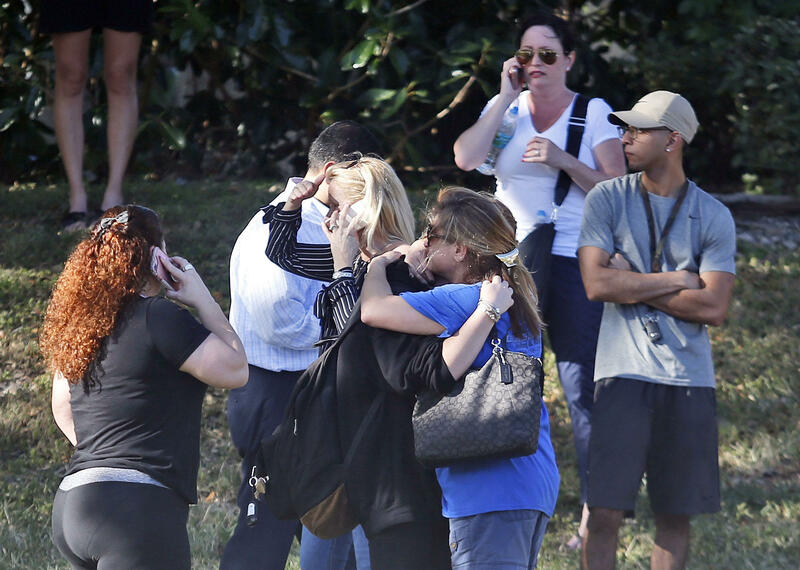 Attorney General Pam Bondi said the state will cover the funeral and counseling expenses for all victims and their families. She also announced that in coordination with the website GoFundMe, the state will monitor people claiming to represent the victims' families. The state will keep an eye on potential price-gouging by funeral home operators. Earlier, Runcie told reporters that he had just given a teacher-of-the-year-award winner a new car and was leaving the event when he heard about the shootings. 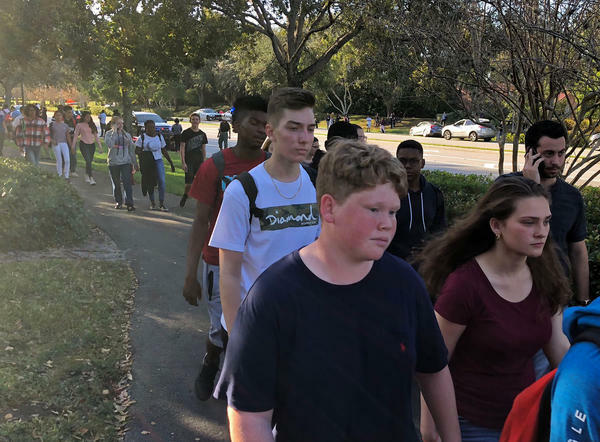 "We are pretty sure the suspect pulled the fire alarm to get the kids out into the hallways," Alison Carew, the mother of 15-year-old freshman twins, told All Things Considered. "And they heard noises and then the teacher shuttled them into safe places." The school was locked down as some students were escorted outside, while others were advised to remain barricaded inside. Carew said her children believe the shots were fired in the freshman building, "a three-story building separate from every other building at the school." "They had to put their backpacks in the middle of the street and [continue] with their hands up," Carew added, speaking of her kids. "Their backpacks were searched, and they were subsequently escorted off the campus." 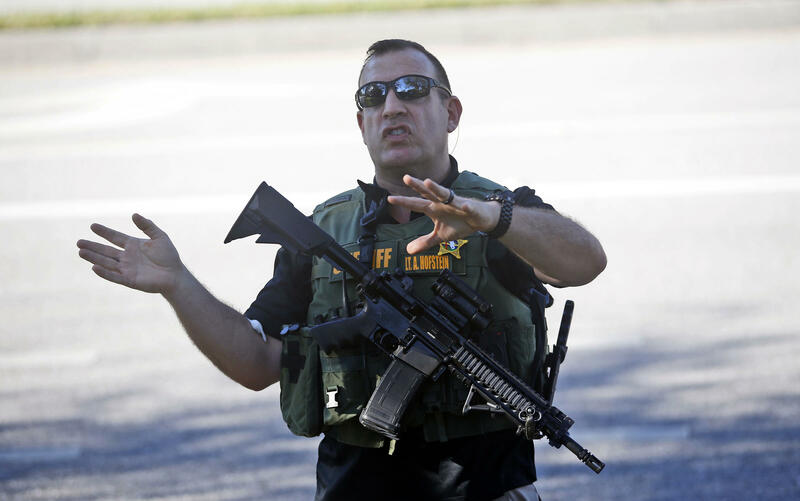 Authorities have not determined a motive for the shooting. Israel said that his triplets had graduated from the same school. "It's a horrific, horrific day," he said. 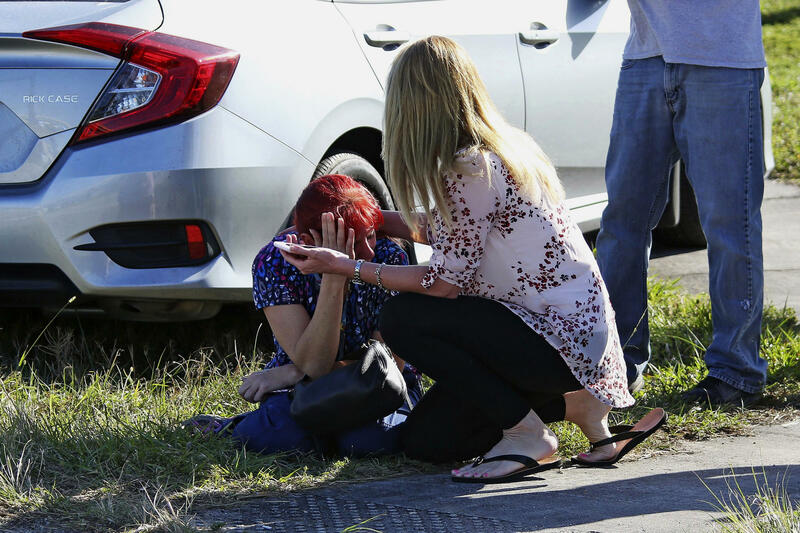 In a tweet, President Trump said, "My prayers and condolences to the families of the victims of the terrible Florida shooting. 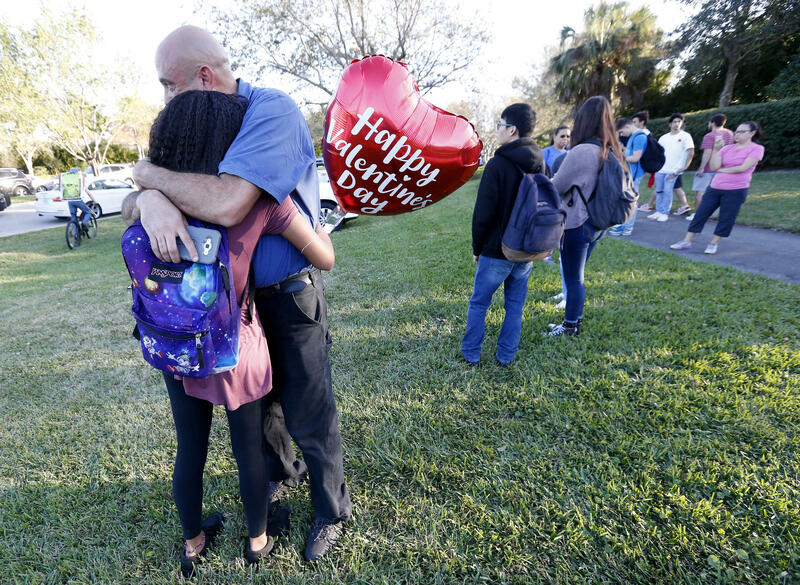 No child, teacher or anyone else should ever feel unsafe in an American school."